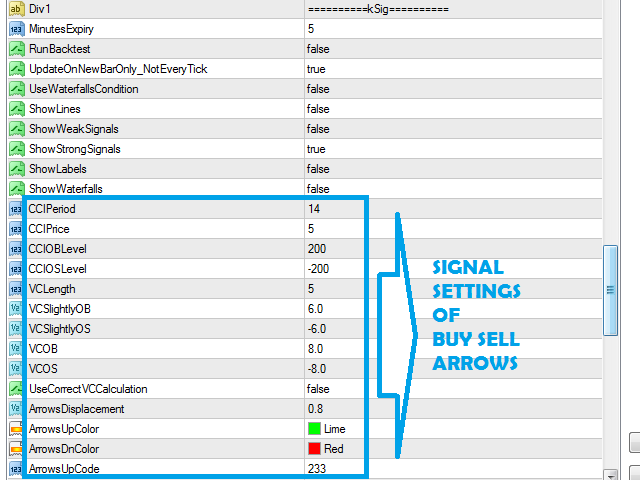 The Indicator works on an algorithm of Buy and Sell signals. 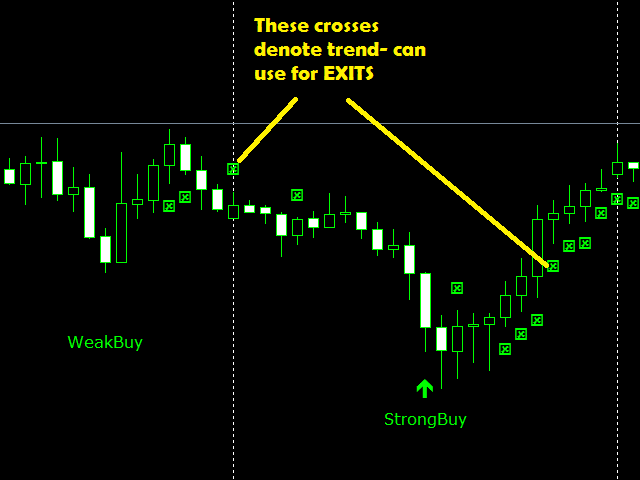 The signals indicate strong reversal points (Tops/bottoms). 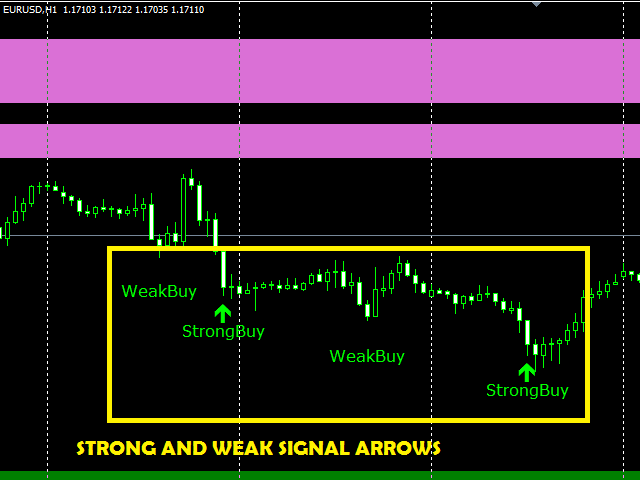 The indicator gives signals on any currency pairs and instruments. 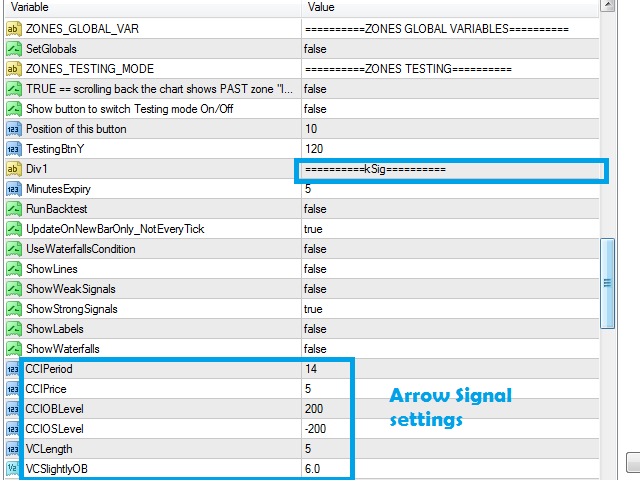 It also has a setting for adjusting the frequency of the signals. 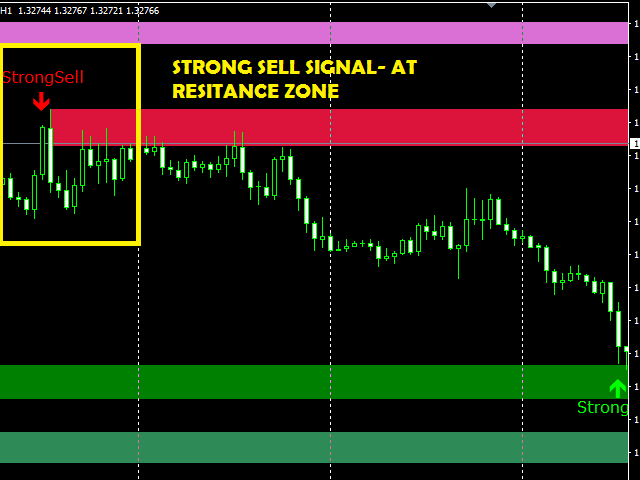 It is further strengthened and made robust by the support and resistance zones. There are different qualities of zones as per robustness. BackLimit - default is 10 000. Check the past bars for formations. First Time Frame - M15 (default is 15 min). 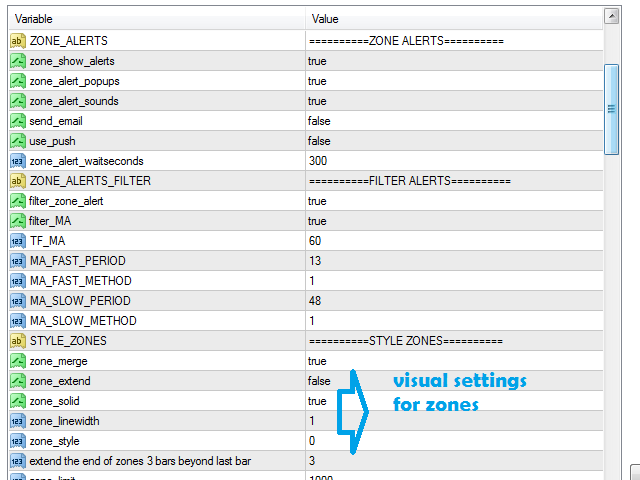 Input the timeframe for the zone. zone_alert_waitseconds - 300. Delay set between alerts repeats. filter_zone_alert - true. apply the filters to the alerts. filter_MA - true. apply the filter. 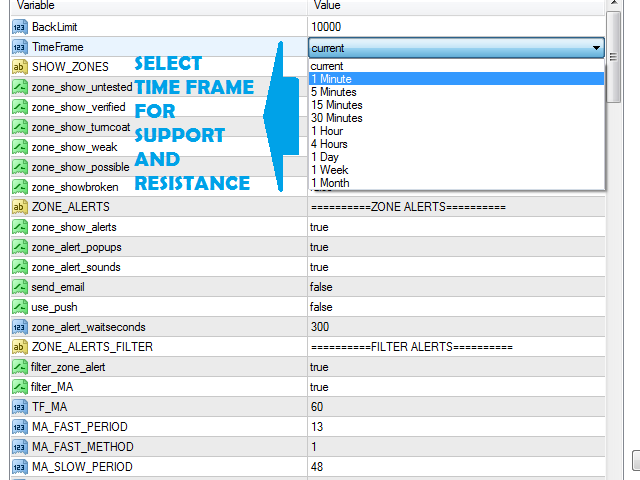 TF_MA - 60. timeframe for filtering the alerts. MA_FAST_PERIOD - 13. Period used for the filter. 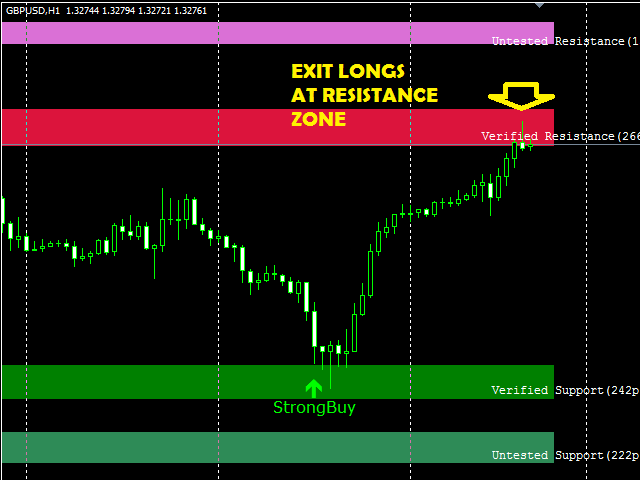 MA_FAST_METHOD - 1. like SMA, EMA, WMA. MA_SLOW_PERIOD - 48. filter Period. zone_merge - true. The zones get merged. zone_extend - false. The zones will extend to the latest bars. zone_solid - true. Fills the color. zone_linewidth - 1. Zone thick. 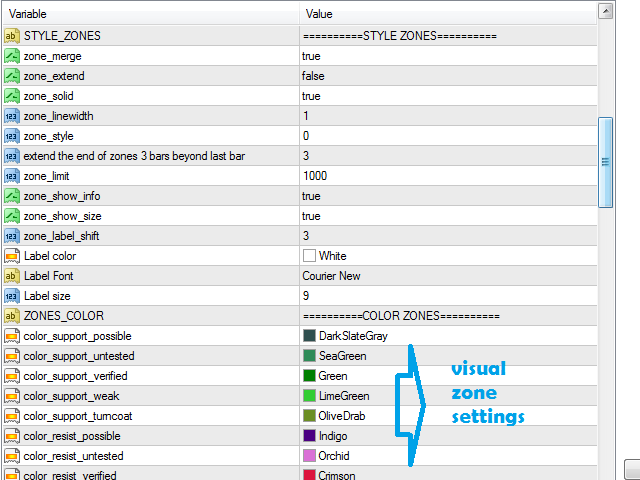 zone_style - 0. zone areas. 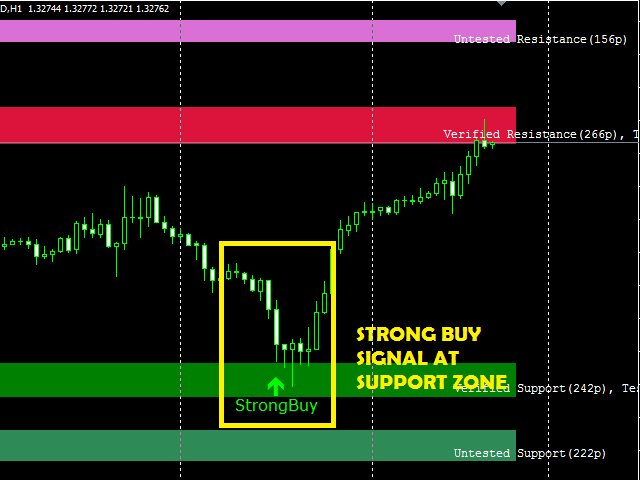 extend the end of zones 3 bars beyond last bar - 3.
zone_limit - 1000. the zone extended limit. zone_show_info - true. Zone statistics. zone_show_size - true. Zone Size. zone_label_shift - 3. text info labels. color_label - White. Label color. font_label - Courier New. Label font. size_label - 9. Label size. 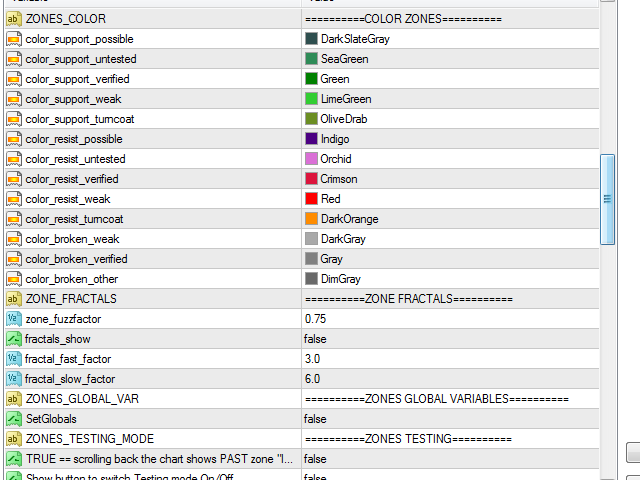 zone_fuzzfactor - default is 0.75.
fractal_fast_factor - default is 3.0.
fractal_slow_factor - default is 6.0. 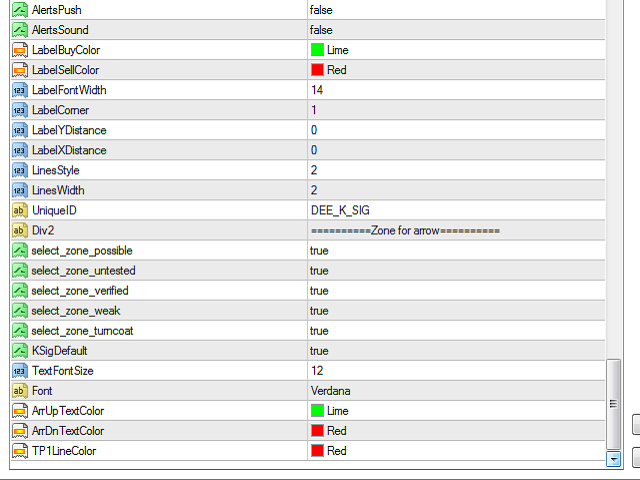 TRUE == scrolling the chart back Displays PAST zones= false. Position of this button = 10.